The following diary account comes from Thomas Wentworth Higginson’s famous book Army Life in a Black Regiment. 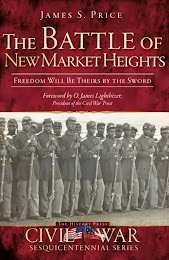 Higginson was a fiery abolitionist before the Civil War and once fighting had begun he was appointed to command the 1st South Carolina Volunteer Infantry Regiment (African Descent). His account of the celebrations that took place on the day that the Emancipation Proclamation went into effect serves as a touching reminder of how 148 years ago today many considered the new year to be the year of Jubilee. A happy New Year to civilized people,—mere white folks. Our festival has come and gone, with perfect success, and our good General has been altogether satisfied. Last night the great fires were kept smouldering in the pit, and the beeves were cooked more or less, chiefly more,—during which time they had to be carefully watched, and the great spits turned by main force. Happy were the merry fellows who were permitted to sit up all night, and watch the glimmering flames that threw a thousand fantastic shadows among the great gnarled oaks. And such a chattering as I was sure to hear whenever I awoke that night! "I tink myself happy, dis New Year's Day, for salute my own Cunnel. Dis day las' year I was servant to a Gunnel ob Secesh; but now I hab de privilege for salute my own Cunnel." About ten o'clock the people began to collect by land, and also by water,—in steamers sent by General Saxton for the purpose; and from that time all the avenues of approach were thronged. The multitude were chiefly colored women, with gay handkerchiefs on their heads, and a sprinkling of men, with that peculiarly respectable look which these people always have on Sundays and holidays. There were many white visitors also,—ladies on horseback and in carriages, superintendents and teachers, officers, and cavalry-men. Our companies were marched to the neighborhood of the platform, and allowed to sit or stand, as at the Sunday services; the platform was occupied by ladies and dignitaries, and by the band of the Eighth Maine, which kindly volunteered for the occasion; the colored people filled up all the vacant openings in the beautiful grove around, and there was a cordon of mounted visitors beyond. Above, the great live-oak branches and their trailing moss; beyond the people, a glimpse of the blue river. "My Country, 'tis of thee, Sweet land of liberty, Of thee I sing!" People looked at each other, and then at us on the platform, to see whence came this interruption, not set down in the bills. Firmly and irrepressibly the quavering voices sang on, verse after verse; others of the colored people joined in; some whites on the platform began, but I motioned them to silence. I never saw anything so electric; it made all other words cheap; it seemed the choked voice of a race at last unloosed. Nothing could be more wonderfully unconscious; art could not have dreamed of a tribute to the day of jubilee that should be so affecting; history will not believe it; and when I came to speak of it, after it was ended, tears were everywhere. If you could have heard how quaint and innocent it was! Old Tiff and his children might have sung it; and close before me was a little slave-boy, almost white, who seemed to belong to the party, and even he must join in. Just think of it!—the first day they had ever had a country, the first flag they had ever seen which promised anything to their people, and here, while mere spectators stood in silence, waiting for my stupid words, these simple souls burst out in their lay, as if they were by their own hearths at home! When they stopped, there was nothing to do for it but to speak, and I went on; but the life of the whole day was in those unknown people's song. 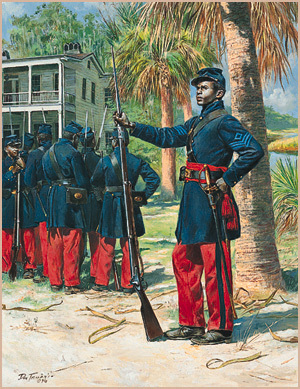 Receiving the flags, I gave them into the hands of two fine-looking men, jet black, as color-guard, and they also spoke, and very effectively,—Sergeant Prince Rivers and Corporal Robert Sutton. 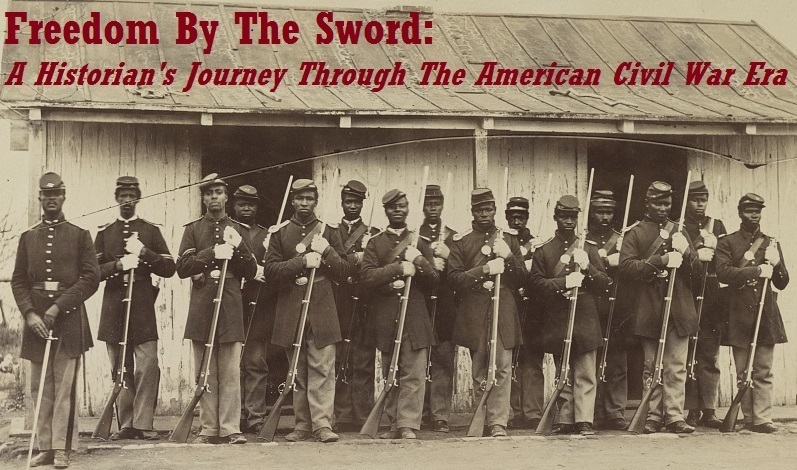 The regiment sang "Marching Along," and then General Saxton spoke, in his own simple, manly way, and Mrs. Francis D. Gage spoke very sensibly to the women, and Judge Stickney, from Florida, added something; then some gentleman sang an ode, and the regiment the John Brown song, and then they went to their beef and molasses. Everything was very orderly, and they seemed to have a very gay time. Most of the visitors had far to go, and so dispersed before dress-parade, though the band stayed to enliven it. In the evening we had letters from home, and General Saxton had a reception at his house, from which I excused myself; and so ended one of the most enthusiastic and happy gatherings I ever knew. The day was perfect, and there was nothing but success.